superior picture quality, and larger screen sizes. Samsung’s new flagship Smart LED and Plasma television series allows users to enjoy seamless navigation, intuitive control and personalized user experiences. A new ‘Made for India’ LED television series too is being launched in the Indian market. “In the Year 2013, we will strengthen our legacy of introducing televisions that have the best in class design, superior performance as well as feature innovations that our customers have grown to love us for. Consumers require innovation and Samsung has responded to this need by launching televisions that are clearly category defining products. 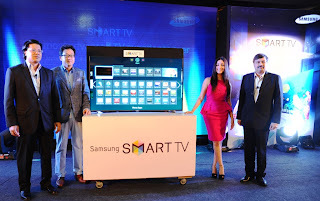 These products have given our consumers a reason to upgrade and what we are witnessing in India is a dramatic transition from CRT to Flat Panel TVs and now to Smart TVs,” said Mr. SK Kim, Sr. Vice President, Consumer Electronics, Samsung India. content, and a quad-core processor – making it even easier and faster for consumers to toggle between apps, online services and on-air TV. interaction, users can now rotate images, or simply zoom in and out with two hands. Voice control capabilities have also been enhanced. Samsung Smart TV is now able to understand more than 300 commands with much better language recognition rates. In addition, a new Smart Touch Control is provided with the Samsung’s new Smart TVs, wherein all number keys have been replaced by a touch pad, on which users can simply write the channel number they want and flip and scroll the screen. It can also control devices made by other manufacturers through a very simple set-up. Samsung is providing consumers with a simpler way to embrace the discovery of new content and experiences with a completely redesigned Smart Hub. The 2013 Smart Hub provides consumers with an easy way to organize and navigate personalized content through an updated interface and dynamic thumbnail previews within three newly designed panels: Apps; Photos, Videos & Music; and Social. The new Apps panel of Samsung’s Smart Hub allows users to display up to 30 app icons on one page, which users can customize so that their favorite apps are easy to access. Combined with Samsung’s enhanced Motion Control – which allows users to swipe, pinch to zoom, or use a flip motion to easily move between Smart Hub panels – consumers can now navigate and control their TV like never before. This advanced TV user experience has been expanded to smartphones and tablets, thanks to Samsung’s leadership in connectivity. Viewers can use their devices as a remote control or simultaneously enjoy two different pieces of content from a TV or Blu-ray player on a second screen. They can also mirror their Smart TV content on a tablet to take it with them around the home. “Our 2013 Smart TVs offer effortless, intuitive ways for consumers to discover and share more of the content they love while creating the ultimate home entertainment experience,” said Mr. Kim. Samsung also is delivering on its promise of bringing evolutionary capabilities to its TVs with the introduction of its Evolution Kit. Available on select 2012 Series 7, 8 and 9 Smart TVs, the Evolution Kit provides both software and hardware updates that include access to the 2013 Smart Hub and other Smart features, and transforms the set’s dual-core CPU to quad-core, resulting in faster internal processing speeds. Samsung’s 2013 Smart TVs will also be equipped with slots for Evolution kits. Samsung current Smart TV range is available in screen sizes between 32” to 65” priced between Rs 37,900/- to Rs.367,500/-. Samsung today also showcased its first Ultra High Definition TV (UHD TV), the 85S9. The 85S9’s stunning Timeless Gallery design sets a new standard for TV craftsmanship, with the TV appearing to float within its frame and juxtaposing its classic minimalism with the striking 85-inch display. Both aesthetically pleasing and functional, the 85S9 includes Samsung’s “One Connect” feature, which eliminates cable clutter by requiring only one cable to connect to the TV and creates a perfect “Clean Back” look. The UHD TV’s larger screen size is part of Samsung’s efforts to meet consumer demand for larger-screen TVs – the fastest growing TV segment in the region. Blending technology excellence with fine craftsmanship, the 85S9 offers four times the resolution available on existing Full HD displays to deliver beautiful detail, unmatched clarity and vivid picture quality. The 85S9 also includes Samsung’s proprietary up-scaling engine which can up-convert HD or Full-HD to UHD-level picture quality by restoring information details to create greater precision for real-life picture quality. In addition to the up-scaling engine, Samsung is addressing current conflicting UHD content industry standards in several other ways to ease purchasing concerns and to ensure that users will be able to view UHD content for years to come. Five new Plasma televisions across 43”, 51”, 64” screen sizes were introduced in Series 8 priced between Rs 35,500/- to Rs 209,900/-. “Even as we work towards enhancing the Indian consumers’ experience by introducing India relevant applications for televisions, we are also introducing new models that have been especially developed basis feedback received from Indian consumers,” said Mr. Mahesh Krishnan, Sr. Vice President, Consumer Electronics, Samsung India. Samsung LED TV Series F5100, F4800, F4100 provides easier connectivity options through its key feature – ConnectShare Transfer – which allows consumers to share content between devices via USB, eliminating the need for a computer. These LED TV series offer two USB ports on the side of the TV to plug in pen drives, smartphones or other storage devices, resulting in a more convenient, and efficient home entertainment experience. SRI, Delhi and Samsung R&D center in India especially developed this feature keeping in mind the feedback received from Indian consumers. While these LED TV series are scheduled to be launched globally, India is the first market where they have been introduced. Designed to delight, these television Series offers amazing picture quality created by Samsung wide colour enhancer and clean view that deliver richer colours while deleting digital noise. They also feature Triple Protector that ensures protection against electrical surges, lightning as well as humidity. Samsung LED TV Series F5100, F4800, F4100 are available in screen sizes between 22” to 46” across Series 4 and 5 priced between Rs.15,900 to Rs 76,500/-.The F4800 series of LED TVs is sound oriented with Front woofer and speakers with an output of 800 PMPO Sound. “With the launch of our 2013 Smart TV range, we are looking to consolidate our leadership in the Panel TV market in India. We expect LED TVs to drive our Panel TV growth, with Smart TVs contributing atleast 20% of our Panel TV volumes this year,” said Mr. SK Kim. Samsung’s entire Flat Panel TVs product portfolio has 43 models across LED, LCD and Plasma technologies with screen sizes ranging from 22” to 75”, priced between Rs. 14,500/- to Rs.750,000/-.